EQUIPMENT SITS between the Martins Ferry High School baseball (left) and softball fields Monday morning. Work on the two fields has been delayed by all of the precipitation this winter. The fields aren’t expected to be completed until early next month, which has caused both of the teams to find alternate sites for early season home games. MARTINS FERRY — Mother Nature has thrown Martins Ferry’s baseball and softball teams a curveball. While the facility that houses both diamond sports teams was undergoing a total facelift, the almighty ruler of the weather deposited a heavy amount of rain high atop the Purple City, thus forcing a delay in the project. “This project was supposed to be done the third week of October. Obviously, that hasn’t happened,” Martins Ferry Schools Superintendent Jim Fogle said Monday morning while looking over the project. “What can you do? Who would’ve thought we would have a year with a large amount of rainfall? It has really hindered the progress of the project. Fogle said Ag Design of Seville, Ohio, is doing the work. It also constructed the new Bellaire baseball field in Neffs. Both playing surfaces — infield and outfield — have been skimmed down and leveled off. New fencing has been installed and drainage pipes have been laid. Our baseball and softball coaches had to come up with plans for the first half of their respective seasons, Fogle added. 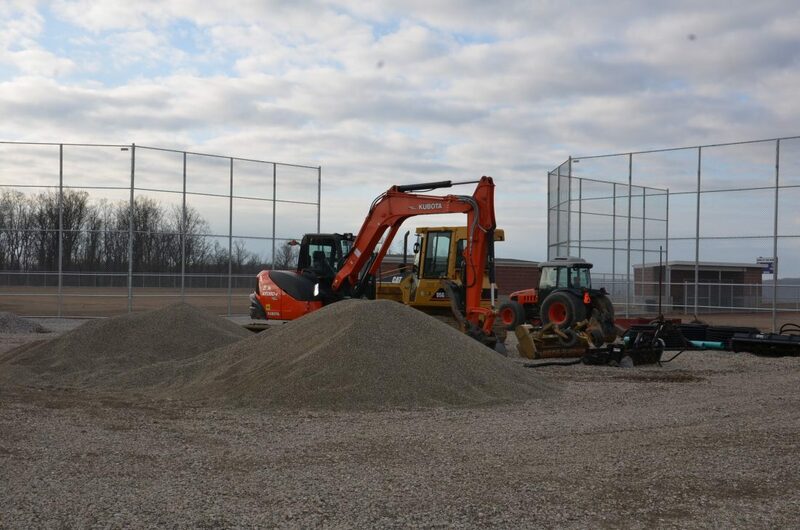 The Purple Riders will play their home games at two different sites — the Niekro Diamond in Brookside and Henning Field in Crescent — until the new diamond is ready. “I would like to thank (Bridgeport athletic director) Greg Harkness and (Bartons Braves manager) Billy Timko for allowing us to use their fields,” Reasbeck acknowledged. They both a great job of helping us out. As for Williams, her Purple Riders have been practicing on the artificial surface inside the Dave Bruney Football Complex. However, they won’t be able to play their home games there. “Fortunately, the school board and athletic board have made it so that we are going to be able to play our home games at Ayers Elementary School, so we will still be able to play on our campus,” Williams said. “They are putting a lot of work into that field to make it playable for us. She said the dimensions are perfect for high school softball. Martins Ferry hosts Linsly Tuesday, April 2, at 5 p.m. in its home softball opener.